High Five (ハイタッチ！) is the third opening theme to the Pocket Monsters Diamond & Pearl TV series. 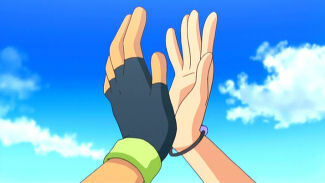 Unlike the previous theme, Together 2008, High Five uses all-new animation. The song's Japanese title, High Touch, is an example of wasei-eigo and translates to what we native English speakers would call a high five. Kiai komete Juu Man Boruto! Omotta to'ori ni waza mo kimari dasu! Ude o nobashi hai tatchi! Sora no shita de hai tatchi! Umaku itta ne hai tatchi! Motto to'oku ni ikeru ze!